To Cite: Mousavi S A, Shahbazi M, Arabameri E, Shirzad E. The Effect of Virtual Reality Training on Learning and Kinematics Characteristics of Dart Throwing, Int J School Health. 2019 ; 6(1):e84300. doi: 10.5812/intjsh.84300. Background: Numerous studies proposed the improvement of movement skills on sport-context by virtual reality interaction. Objectives: The purpose of this study was investigating the effect of virtual reality on dart throwing performance and kinematics. Methods: A total of 24 healthy junior high school boy students (aged = 13.54, SD = 0.50) participated in a virtual reality game of dart throwing in the Iranian academic year of 1396-97. We investigated the mean radial error and bivariate variable error to measure performance outcomes, and preparation time, throwing time, maximum flexion angle, release time angle, and angular velocity to measure movement kinematics. The X-box Kinect (Microsoft, USA) body movement track, standard dart board (unicorn ELIPSE HD) and Casio High-Speed camera (EX-ZR1000, China) sampling at 240 Hz were used to measure performance and capture dominant upper limb motion during dart throwing play. Before exporting data to SPSS 25, Kinovea and MATLAB R2015b were used to analyze videos and smoothing data. Repeated measure ANOVA was used to analyze variables separately. Results: The results showed that virtual reality intervention was significantly effective on performance and movement kinematics. Mean radial error (P = 0.004) decreased from 19.67 ± 6.20 in the pre-test to 17.46 ± 5.81 in the acquisition, and 14.75 ± 4.01 in the post-test. Bivariate variable error (P = 0.001) decreased from 11.46 ± 1.21 in the pre-test to 11.20 ± 1.56 in the acquisition, and 10.03 ± 1.11 in the post-test. Other kinematics factors showed the significant difference in phases. Conclusions: These findings suggest that virtual reality can be applied as an effective instrument in discrete motor skill learning. Simulators are common instruments applied in motor and cognitive skills. The important role of simulators is providing a situation for individuals to practice a task for learning that is similar to a real-world task (1). Video games that combine physical exercise with gameplay are known as ''exergames'' (2). Virtual reality game is a kind of exergame that includes playing the game with the movement senses e.g. X-box Kinect (3). In the VR environment, athletes become physically active through the control of features of the game such as control of an avatar in the VR environment, these features sometime depend on game type against an opponent. VR exercises in return of exergames mainly focus on enhancing physical fitness, strength, or skills (4). One of the important features of the VR environment is the attendance of others in the VR environment that may introduce the sense of immersion (5). In this system, a person is placed in an environment similar to the real-world environment and can interact with the VR objects (3). In fact, the review literature revealed that VR can be the helpful instrument in many fields. This system helps astronauts and military system as a simulator to ease performing, even NASA used it for its flight missions (3, 6). The medical field widely used the virtual environment as an effective training tool for surgical motor tasks (7). It can also be used as a neuroscience studies tool due to the fact that scientists can have an accurate control and observe natural behaviors (2, 8, 9). In addition, these technologies are applied as a useful tool in rehabilitation and balance function, and cause the decrease in costs in social and health environments (10). In addition, VR games operate as a recreational activity tool for aged individuals at home (11). The VR environment has the ability of training and assessment of different sports skills and researchers considered important aerobic sports factors as the skill-based factors in relation to the VR system (5). Nowadays researchers are pursuing the enhancement of sensorimotor skills by applying VR in the sports environment (2, 12) due to the fact that playing and applying VR games cause quick learning (7). Scientists found that virtual game activities such as running, bowling, volleyball, tennis that is a simplified version of the real sport, can promote players physical fitness, physiological, and psychological results (2, 4-6). A study in the bike experiment for rehabilitation indicated that there was the significant difference in endurance between two groups, then, the VR group had a longer endurance than the control group (13). Researchers applied VR systems frequently in the dynamic and statistic balance function with different healthly and unhealthy individuals, especially with adults. Generally, subjects showed improvement in their balance measurements (6, 14-17). In addition, VR games enhance gross motor skills and cause more participation in physical activity (18). Hence, VR is an educational opportunity window for different individuals of different ages and health conditions. It can suggest new perspectives to users and could lead to more understanding via games (3, 19). The researcher often used endurance and persistence sports such as cycling, running, and rowing in VR research methodology (5, 10). On the other hand, training with VR can be proper for anticipation and decision-making skills in throwing and aiming tasks (12). Little research investigated learning of motor skills in novice people through VR and is unknown whether children in the range of 14 years old may improve their discrete skills through simulated VR skills. In addition, no studies to date considered the movement kinematics of dart throwing skills in children through VR. Finding performance outcomes and movement patterns of VR will help certain individuals applying of a virtual reality system as an effective educational tool in motor skills training. The aim of this study was investigating performance results and movement kinematics of dart throwing of children in a VR environment. We hypotheses that VR dart throwing has an effect on learning and movement kinematics of novice children. The sample size of the study comprised of 24 Shahid Madani Junior High School male students in Qazvin city (13.54 age mean, 0.5089 SD) selected from 25 on the basis of Cochran sampling formula. One of them was left-handed and 23 of them were right-handed (identified by Edinburgh Handedness Inventory). All the participants threw with their dominant hand. We applied some criteria such as; the age range (12 to 14 years), do not practice virtual dart playing beforehand, normal vision, and hearing based on their school health records as an inclusion criterion. After permission to enter the study, we excluded any participants that had developmental, musculoskeletal, neurological disorder, and poor motor coordination (below the 16th percentile based on Movement Assessment Battery for Children-Second Edition (MABC-2) (14). All students had the terms of participation in this study. Participants could withdraw the study whenever they want, no participant drew back the study. The consent was acquired from the students and the director of the school. Virtual reality dart throwing was the independent variable in this study. Performance dependent variables were; mean radial error and bivariate variable error. A mean radial error was the average deviation of the dart from the bull's eye, low score was better. The bivariate variable error was computed through the standard deviation of each throw from the mean of throws (20). Kinematics dependent variables were; preparation and throwing time, elbow maximum flexion angle, elbow extension (release time) angle, and angular velocity. Preparation time was computed as the moment of release in trail n to maximal flexion of the elbow in next trail. Throwing time was computed as the moment of maximal flexion of the elbow to moment of release in a similar trail. Angular velocity was calculated by the difference of degree between elbow maximum flexion and release time divided to throwing time (14). Standard (unicorn ELIPSE HD) dartboard with official height (1.73 m off the ground), distance (2.37 m from the throwing line), and 23 gm PUMA darts were used for three test periods of the experiment. To play dart in a VR environment, X-box 360 and Kinect (Microsoft, USA), body movement track without a hand-held sensor was used. To display VR, one generally could use computer screens, projectors, or TV (5). Participants played the dart game from Kinect Sports Season two (Microsoft, USA) on the TV screen (LCD, 42 Samsung). In many sports, especially in locations where players should move in a limited specified space such as dart throwing, to measure the player's movements, it should be used from motion capture (12). A Casio High-Speed camera (EX-ZR1000, China), sampling at 240 Hz, was used to capture dominant upper limb motion during dart throwing. The camera was fitted perpendicular to the line of the throw and tracked the position of the light reflector markers in two-dimensions in the sagittal plane. A total of three light reflector markers were attached to the acromion process, lateral epicondyle, and styloid process of the dominant hand that makes it possible to record preparation and throwing time on the sagittal plane (14). The camera was placed in a fixed position on the tripod for recording. All of the participants were trained on how to take the darts, stand in the starting line, and how to accurately throw in the bulls eye. They had five throws on the real dart board to exercise. After, participants performed six throws, respectively, as the pre-test. They were trained to throw as much as possible with the least spend of time between throws. The acquisition was performed 24 hours after the pre-test. Each participant performed 10 blocks of six trails considering two min of rest between blocks. The examiner set up the X-box system and stand in front of Kinect to calibrating for the starting of the game, after his upper and lower limb act as the controller of the system, he played the dart game. He trained the participants how to calibrate and immerse in the Kinect, then they had three throws to ensure doing properly. The last block computed as an acquisition test, in the same condition as the pre-test. 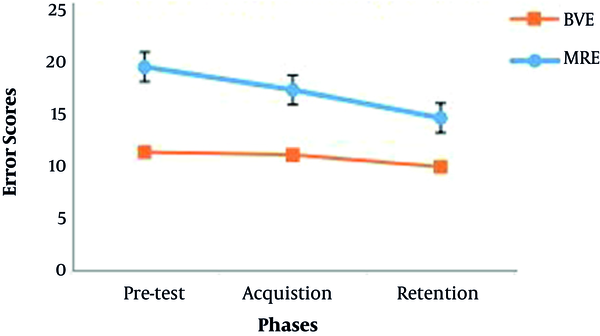 Participants had the same retention as the pre-test, 48 hours after acquisition. We asked the participants to throw darts in the sagittal plane only by flexion and extension of dominant arm and wrist (the examiner trained all participants, do not deviate sides in the throw) as previously been done (14). Every six trail in pre-test, acquisition, and retention were recorded with a camera at the exterior side of the dominant hand of throwers. Video data were analyzed by using Kinovea - 0.8.26 motion analysis software, see Figure 1. Data were analyzed for outliers and standard parametric assumption, distribution was normal with the Shapiro-Wilk test of normality. We used descriptive statistics to present the study population, mean, and standard deviation. Repeated measures ANOVA (3 times × 1 independent variable) was analyzed separately for behavioral performance and kinematic parameters. SPSS Version 25 was used to analyze data. Critical alpha was set at 0.05. In addition, MATLAB R2015b software was used to compute kinematics (smoothing data with Butterworth Low pass filter; with cut off frequency = 10) and performance measures (MRE, BVE) before exporting to SPSS. A total of 24 individuals participated in this study, one of which was left-handed and the rest were right-handed. All of them were students of the 7th-grade high school. Their mean age was 13.54, SD = 0.50. None of the participants had no experience throwing darts skills. Descriptive analysis of mean radial error (MRE) and bivariate variable error (BVE) is presented in Table 1. There was a statistically significant effect of VR training on MRE (P = 0.004), see Figure 2. Post hoc tests using the Bonferroni correction revealed that VR training elicited a reduction in MRE from pre-test to acquisition, which was not statistically significant (P = 0.439). However, retention MRE had been reduced to 14.75 ± 4.01, which was significantly different from pre-test (P = 0.005). The VR training program had a significant effect on bivariate variable error (P = 0.001), see Figure 2. Bonferroni Post Hoc test indicated that pre-test and acquisition did not have the significant difference in BE. However, retention BEV had been reduced to 10.03 ± 1.11, which was significantly different to pre-test (P = 0.001) and acquisition (P = 0.014). There are descriptive results for kinematics measures in Table 2. Mauchly's Test of Sphericity indicated that the assumption of sphericity had been violated, χ2 (2) = 8.47, P = 0.014, and therefore, a Greenhouse-Geisser correction was used. The analysis revealed that VR training had a significant effect on preparation time (P = 0.014), see Figure 3. A Bonferroni Post Hoc test revealed that preparation time in the retention phase had been reduced to 2.80 ± 0.39, which was significantly different to pre-test (P = 0.043). To analysis throwing time, Mauchly's Test of Sphericity revealed that the assumption of sphericity had been violated, χ2 (2) = 7.19, P = 0.027, therefore, Greenhouse-Geisser correction indicated a significant effect of VR training on throwing time (P = 0.003), see Figure 3. A Bonferroni Post Hoc test appeared that retention throwing time had a significant reduction (0.12 ± 0.27), which was different to pre-test and acquisition (P = 0.018, P = 0.011, respectively). Analysis revealed that VR training effects on elbow maximum flexion between pre-test, acquisition, and retention (41.91 ± 8.68, 44.33 ± 8.64, 43.39 ± 9.89, respectively). Nevertheless, the difference was not significant, see Figure 4. VR training affected significantly on release time (P = 0.001), see Figure 3. Post Hoc correction with Bonferroni indicated that retention release time had been increased to 107.65 ± 12.21, which was significantly different to pre-test (P = 0.001). The result indicated that this training effects significantly on the angular velocity (P = 0.001), see Figure 5. Post Hoc tests revealed that the difference from pre-test to retention test was significant (413.11 ± 74.50 vs 467.25 ± 101.34, P = 0.004, respectively). The aim of this study was to investigate whether virtual reality effects learning and kinematics characteristics of novice dart throwers. We compared the mean radial error, bivariate variable error, preparation and throw time, elbow flexion and release time angle, and angular velocity of throwers in repeated tests. The finding of this study was consistent with our hypothesis. Results demonstrated that performance errors reduced from pre-test to retention. We found kinematics differences from pretest to posttest, except in maximum flexion of the elbow. Time factors indicated the reduction in both preparation and throwing time. In addition, results revealed that the elbow flexion angle in release time and angular velocity increased in retention test. Research on the physical fitness is not all virtual reality's efficiency, while skills performance is the core of any researchers. Murray et al. (4), in a rowing exercise in VR, revealed that a higher level of performance for those who did the task in a virtual reality condition instead of non-virtual reality. Considering the visual information of handball goalkeeper performance with the video clip and virtual environment procedure resulted in more effective and more accurate performance for a handball goalkeeper when the encounter with virtual handball thrower, therefore, the radial error of VR group was significantly lower than video clip group (21). In addition, another research revealed an improvement in throwing after training and between tests in both groups VR and real. VR training group in throwing accuracy was better than real training group. VR group had a smaller distance to the bull's eye (22). In a study on dart throwing performance in expert and novices, it was found that radial error of throwing on the bull's eye was smaller than external and internal throwing condition, whereas wearing goggles (23). Our research shows that results in throwing performance are consistent with these studies. Perhaps reaching to greater visual acuity than other groups, according to the experimental conditions, is the reason for the error reduction of the subjects in these studies. On the other hand, maybe the number of trails leads to it. A study for industrial maintenance and assembly (IMA) task with, virtual reality in VR-control and AR-control groups, appeared that VR and AR participants should do more training in comparison to control groups (24). Lohse et al. (25) investigated internal and external focus of attention in dart throwing on healthy participants. This study indicated that accuracy improved and error reduced from pre-test to retention phase. Other research used physical practice, skilled, and unskilled models throws with KR/no-KR conditions for examining novice throwers. Results showed more accuracy for physical practice in pre-test than models. Unskilled models showed more consistent performance in the acquisition and values of accuracy got better in retention time (26). Our subjects were both novice players in the dart and in virtual reality. However, they expose error decrease from pre-test to retention test, which is consistent with the mentioned studies. Contrary to what is mentioned, all novice dart throwers of internal and external focus of attention conditions with or without knowledge of result in Schorer et al. (23), research indicated no significant differences that do not comply with our study. Subject's age, skill level, and practice conditions were completely different in two studies. VR games experience a result in improvement of upper limb kinematics and better movement patterns (27-29). In a comparison of real and virtual handball throwers movements, it was found that movement patterns of real throwers and VR throwers did not differ from each other. The handball goalkeeper had the similar leg and arm biomechanics movements in the virtual reality environment with real one in three different throws (30). Study of dart throwing with attention condition indicated significant differences across conditions for novices. Novice's movement duration was slower in internal 1/KR (concentrate on the return point of the movement) and external conditions. However, faster in internal 2/KR and internal/non-KR (concentrate on the release of the dart) conditions (23). Our study complies with this research based on conditions, while variables in studies are varied. In the interceptive task, athletes who used VR condition were faster (concerning the response time) to start their task (31). We found that time variables had differences and get faster in retention test. In the study of Lohse et al. (25), preparation time showed significant differences between phases and increased across blocks. In contrast, our results revealed the decrease in preparation time from pre-test to retention. Movement requirements of VR environment and real-world environment must be identical. In addition, the sensory consequences of the movement is an essential component and must try to supply it. Most of all, an essential feature of skills is movement perception of objects (32). Maybe throwing with Kinect sensor without any dart in hand causes preparation time decrease. Lohse et al., found that throwing time reduced across blocks. It confirms by our finding for throwing time. Focus of attention effected on kinematics movement of dart throwing in the study of Lohse et al., Research indicated that elbow flexion and release time angle were not significantly different in conditions. In addition, the angular velocity difference was not significant between trials and blocks. Another study showed that there isn't the significant difference at the angle of elbow flexion between groups (real, Wii, Move, Kinect) for tennis forehands and backhands. Kinect table tennis had a significantly smaller range than Wii and real group in the minimum angle of elbow in forehands. There was a significantly smaller minimum angle of the elbow for Kinect than other groups in backhand. Kinect average speed was faster than two other VR groups (33). Elbow flexion angle of our participants differed in phases, however, it was not a significant enhancer or reducer. Therefore, it confirms the findings of this variable. While our study revealed that release time angle significantly increased from pre-test to retention phase, the size of the angle (107.65˚) was less than that of the Lohse et al., study. In this respect, this study is not consistent with the above studies. 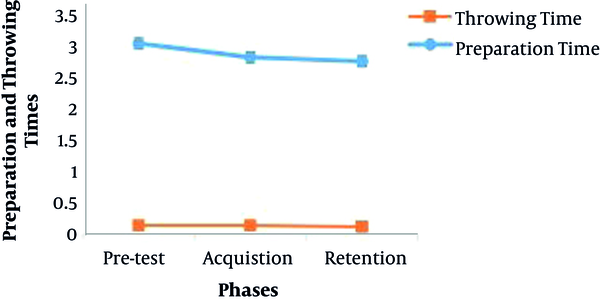 On the angular velocity, our results revealed the increase from pre-test to the acquisition, and acquisition to retention, which is consistent with the VR study of Bufton et al. (33), while not conforming to the study of Lohse et al. (25), Subjects in Kinect experiments have no haptic information; in addition, the experimenter does not present haptic feedback to inform the subjects about objects touch (34). Thus, playing Kinect without any bat, dart, and racket causes a larger and faster hand path (33). It seems that throwing without darts affected the release time angle and angular velocity of our participants. In summary, this study achieved improvement in performance result of dart throwing by VR intervention. Kinematics movements somewhat replicated previous biomechanics studies. In particular, applying VR in sport-context, e.g. discrete motor skills, can be effective and leads to learning of the skill. If the functions of this technology explain clearly for athlete and coaches, expanded application of this instrument in sport-context will be promising. This research has some strengths using accessible and to some extent cheap instruments and congruence and identic samples that were at the age of skills learning. In dart throwing, the weight and force of dart is the requirement of the application, in terms of accuracy and control, should be taken into consideration by researchers. Future researches could compare VR and real-world dart throwing performance result and movement kinematics of all hand joints to clarify more aspects of this field and confirm some transfer. Authors' Contribution: This research is based on the Ph.D. thesis of Seyyed Ahmad Mousavi in the motor behavior field. Dr. Shahbazi and Dr. Arabameri were supervisor in this thesis. Dr. Shirzad was the advisor. Financial Disclosure: All authors of this research disclose any financial and personal relationships with participants or school boards that could inappropriately influence the work. 1. Richard A, Schmidt TDL. Motor control and learning, A behavioral emphasis. 5th ed. 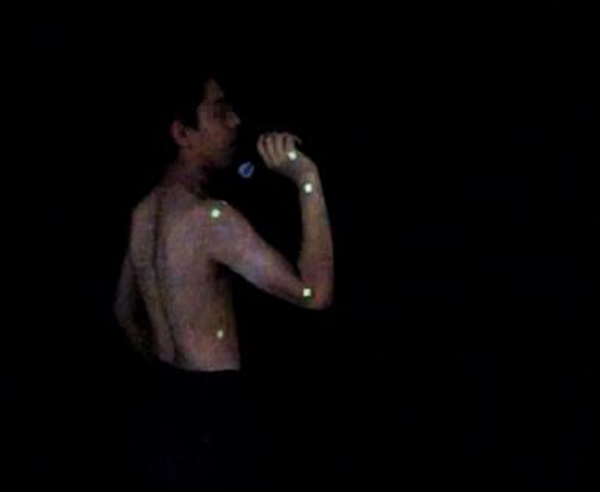 Human Kinetics; 2011. 2. Kulp R, Multon F, Argelaguet F. Virtual reality & sport.In: Colloud F, Domalain M, Monnet T, editors. 33rd International Conference on Biomechanics in Sports, Poitiers. June 29 - July 3; France. 2015. 3. Psotka J. Immersive training systems: Virtual reality and education and training. Inst Sci. 1995;23(5-6):405-31. doi: 10.1007/BF00896880. 4. Murray EG, Neumann DL, Moffitt RL, Thomas PR. The effects of the presence of others during a rowing exercise in a virtual reality environment. Psychol Sport Exercise. 2016;22:328-36. doi: 10.1016/j.psychsport.2015.09.007. 5. Neumann DL, Moffitt RL, Thomas PR, Loveday K, Watling DP, Lombard CL, et al. A systematic review of the application of interactive virtual reality to sport. Virt Real. 2018;22(3):183-98. 6. Siemon A, Wegener R, Bader F, Hieber T, Schmid U. Video games can improve performance in sports-an empirical study with wii sports bowling. Proceedings of the KI Workshop on Human-Machine-Interaction Paderborn: 32nd Annual Conference on Artificial Intelligence. Bamberg, Germany. Citeseer; 2009. 7. Pan Z, Cheok AD, Yang H, Zhu J, Shi J. Virtual reality and mixed reality for virtual learning environments. Comput Graph. 2006;30(1):20-8. doi: 10.1016/j.cag.2005.10.004. 8. Sanchez-Vives MV, Slater M. From presence to consciousness through virtual reality. Nat Rev Neurosci. 2005;6(4):332-9. doi: 10.1038/nrn1651. [PubMed: 15803164]. 9. Minderer M, Harvey CD, Donato F, Moser EI. Neuroscience: Virtual reality explored. Nature. 2016;533(7603):324-5. doi: 10.1038/nature17899. [PubMed: 27193673]. 10. Pedraza-Hueso M, Martín-Calzon S, Díaz-Pernas FJ, Martínez-Zarzuela M. Rehabilitation using kinect-based games and virtual reality. Proc Comput Sci. 2015;75:161-8. doi: 10.1016/j.procs.2015.12.233. 11. Gentile D, Anderson C. Video games. Encycl Hum Dev. 2006;3(1977):1303-7. 12. Kim SY, Prestopnik N, Biocca FA. Body in the interactive game: How interface embodiment affects physical activity and health behavior change. Comput Hum Behav. 2014;36:376-84. doi: 10.1016/j.chb.2014.03.067. 13. Chen CH, Jeng MC, Fung CP, Doong JL, Chuang TY. Psychological benefits of virtual reality for patients in rehabilitation therapy. J Sport Rehabil. 2009;18(2):258-68. [PubMed: 19561368]. 14. Reynolds JE, Thornton AL, Lay BS, Braham R, Rosenberg M. Does movement proficiency impact on exergaming performance? Hum Mov Sci. 2014;34:1-11. doi: 10.1016/j.humov.2014.02.007. [PubMed: 24667304]. 15. Mombarg R, Jelsma D, Hartman E. Effect of Wii-intervention on balance of children with poor motor performance. Res Dev Disabil. 2013;34(9):2996-3003. doi: 10.1016/j.ridd.2013.06.008. [PubMed: 23827983]. 16. Bieryla KA, Dold NM. Feasibility of Wii Fit training to improve clinical measures of balance in older adults. Clin Interv Aging. 2013;8:775-81. doi: 10.2147/CIA.S46164. [PubMed: 23836967]. [PubMed Central: PMC3699053]. 17. Rendon AA, Lohman EB, Thorpe D, Johnson EG, Medina E, Bradley B. The effect of virtual reality gaming on dynamic balance in older adults. Age Ageing. 2012;41(4):549-52. doi: 10.1093/ageing/afs053. [PubMed: 22672915]. 18. Ganier F, Hoareau C, Tisseau J. Evaluation of procedural learning transfer from a virtual environment to a real situation: A case study on tank maintenance training. Ergonomics. 2014;57(6):828-43. doi: 10.1080/00140139.2014.899628. [PubMed: 24678862]. 19. Craig C. Understanding perception and action in sport: How can virtual reality technology help? Sport Technol. 2014;6(4):161-9. doi: 10.1080/19346182.2013.855224. 20. Magill RA. Motor learning: Concepts and applications. 9th ed. McGraw-Hill; 2017. p. 196-7. 21. Vignais N, Kulpa R, Brault S, Presse D, Bideau B. Which technology to investigate visual perception in sport: Video vs. virtual reality. Hum Mov Sci. 2015;39:12-26. doi: 10.1016/j.humov.2014.10.006. [PubMed: 25461430]. 22. Tirp J, Steingrover C, Wattie N, Baker J, Schorer J. Virtual realities as optimal learning environments in sport-A transfer study of virtual and real dart throwing. Psychol Test Assess Model. 2015;57(1):57. 23. Schorer J, Jaitner T, Wollny R, Fath F, Baker J. Influence of varying focus of attention conditions on dart throwing performance in experts and novices. Exp Brain Res. 2012;217(2):287-97. doi: 10.1007/s00221-011-2992-5. [PubMed: 22210117]. 24. Legrand FD, Joly PM, Bertucci WM, Soudain-Pineau MA, Marcel J. Interactive-virtual reality (IVR) exercise: An examination of in-task and pre-to-post exercise affective changes. J Appl Sport Psychol. 2011;23(1):65-75. doi: 10.1080/10413200.2010.523754. 25. Lohse KR, Sherwood DE, Healy AF. How changing the focus of attention affects performance, kinematics, and electromyography in dart throwing. Hum Mov Sci. 2010;29(4):542-55. doi: 10.1016/j.humov.2010.05.001. [PubMed: 20541275]. 26. Weir PL, Leavitt JL. Effects of model's skill level and model's knowledge of results on the performance of a dart throwing task. Hum Mov Sci. 1990;9(3-5):369-83. doi: 10.1016/0167-9457(90)90009-3. 27. Robert MT, Guberek R, Levin MF, Sveistrup H. Motor learning of the upper limb in children with cerebral palsy after virtual and physical training intervention. 2013 International Conference on Virtual Rehabilitation (ICVR). 26-29 Aug; Philadelphia, PA, USA. 2013. 28. Levac D, Pierrynowski MR, Canestraro M, Gurr L, Leonard L, Neeley C. Exploring children's movement characteristics during virtual reality video game play. Hum Mov Sci. 2010;29(6):1023-38. doi: 10.1016/j.humov.2010.06.006. [PubMed: 20724014]. 29. Kiper P, Szczudlik A, Agostini M, Opara J, Nowobilski R, Ventura L, et al. Virtual reality for upper limb rehabilitation in subacute and chronic stroke: A randomized controlled trial. Arch Phys Med Rehabil. 2018;99(5):834-842 e4. doi: 10.1016/j.apmr.2018.01.023. [PubMed: 29453980]. 30. Bideau B, Kulpa R, Menardais S, Fradet L, Multon F, Delamarche P, et al. Real handball goalkeeper vs. virtual handball thrower. Presen Teleoperat Virt Environ. 2003;12(4):411-21. doi: 10.1162/105474603322391631. 31. Oliveira BR, Deslandes AC, Nakamura FY, Viana BF, Santos TM. Self-selected or imposed exercise? A different approach for affective comparisons. J Sports Sci. 2015;33(8):777-85. doi: 10.1080/02640414.2014.968191. [PubMed: 25356844]. 32. Miles HC, Pop SR, Watt SJ, Lawrence GP, John NW. A review of virtual environments for training in ball sports. Comput Graph. 2012;36(6):714-26. doi: 10.1016/j.cag.2012.04.007. 33. Bufton A, Campbell A, Howie E, Straker L. A comparison of the upper limb movement kinematics utilized by children playing virtual and real table tennis. Hum Mov Sci. 2014;38:84-93. doi: 10.1016/j.humov.2014.08.004. [PubMed: 25262339]. 34. Morel M, Bideau B, Lardy J, Kulpa R. Advantages and limitations of virtual reality for balance assessment and rehabilitation. Neurophysiol Clin. 2015;45(4-5):315-26. doi: 10.1016/j.neucli.2015.09.007. [PubMed: 26527045].